Puppets against Brisk: Dojo on No Fat Clips!!! Karate Kid meets Bruce Lee. Who will win? And, above all, how? The director is Ken Lidster. His graduation movie, Balloon, was posted one month ago. 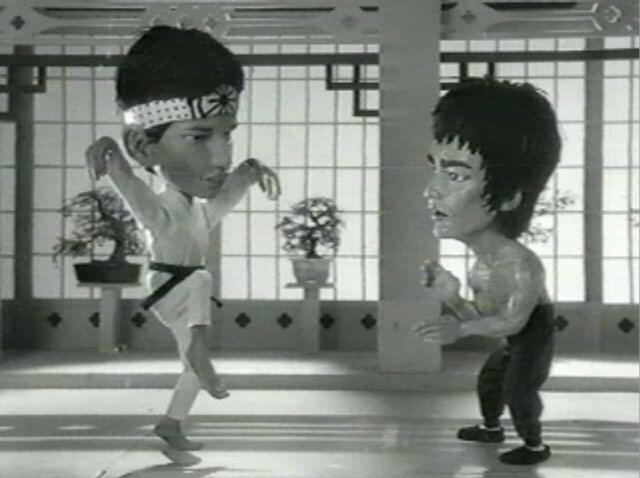 Posts related to Bruce Lee: Mars Delight commercial by Acne. Karate Kid sfida Bruce Lee. Chi vincerà? Ma soprattutto, come? Regia di Ken Lidster, il cui progetto di laurea, Balloon, è stato postato un mese fa. Post riguardanti Bruce Lee: lo spot di Mars Delight diretto da Acne. WATCH: Guarda Dojo su Loose Moose. Posted by DeK on Saturday, June 3, 2006, at 12:42. Filed under Commercials. Tagged Bruce Lee, martial arts. Follow any responses to this post with its comments RSS feed. You can post a comment or trackback from your blog.